All the data is stored on your infrastructure, all identity is reserved for your project, unlike as on platforms. During numerous integration we have built up a number of marketing, security and usability features. Web Wallet solution is a secured cryptocurrency wallet. With the help of the wallet, participants buy tokens and manage them after. When the campaign is over – store tokens, transfer them to other users or move them to an exchange for further trading. Our system can be suited with any changes and new features needed e.g. smart contracts or 3rd party services. Our solution has the lowest cost (both upfront and general), with the same features (see report above). You can issue your ERC-20 token and all smart contracts needed for sale. Including stage different timeline and price. All collected funds would be transferred straight to your or stored in securely in the encrypted environment. We support ETH, BTC, XEM and a number of popular coins through ShapeShift exchange, as well as fiat. You can select between manual or automated (Onfido, Synopsis) check. All the personal data is protected. The app perfectly works on any mobile screen. It can be also installed to the home screen and work without internet. User profiles and all events can be sent to the CRM (currently Drip) to build advanced communications. Google and Facebook analytics are also included. You can incentivize your investors to purchase earlier and get bonuses for attracting referrals. The app is professionally translated to 5 languages (english, korean, japanese, mandarin and russian) and you can easily add more. We use smart contracts provided by Zeppelin (best in contracts security) and publicly audited for a long time. Our system is built in the way that only you have access to the collected funds, without intermediaries. The app uses Amazon Cloud with all necessary protection and monitoring. Built as a Progressive Web App this solution can be installed like an app and work even in the offline mode. This feature allows you to dedicate your tokens to the pool managers, so they can sell them further to their audience. This is an experimental solution that locks fund under an Aragon DAO and gives access of the funds usage to the community. We can review tokenomics and product architecture and provide our feedback and recommendations. Our investor panel look simple, but in order to layout marketing information we can create a colorful front page. If you don't have a CTO or need some specific blockchain expertise we can help with that. For or after ICO we can help with delivering a proof of concept or even putting a dedicated team for your product. We dedicate some of engineering power for monitoring and quick reaction in cases of any hacking or unforseen problems. We dedicate a customer support specialist to answer on all question of the investors that can occur during the usage of the platform. Working in the software development field since 2010, we've made a contribution into a great variety of projects of some of the biggest names in the world. Make sure your crowdfunding campaign is strong. 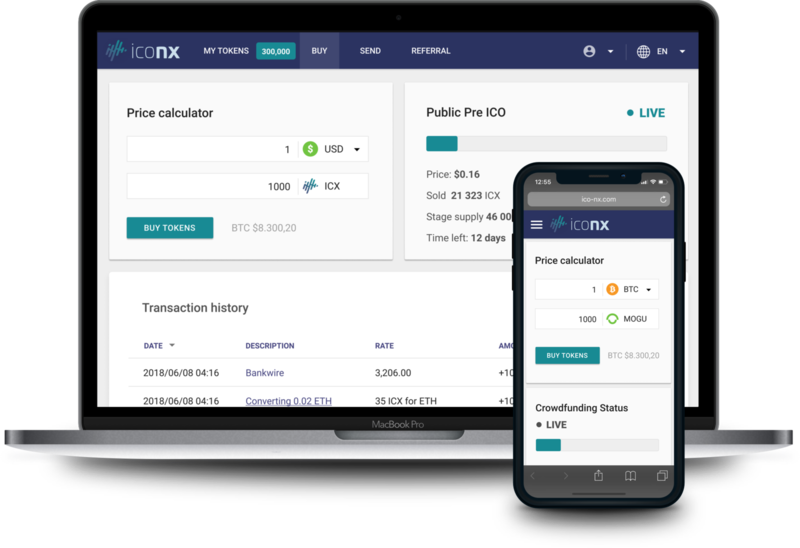 Make sure your ICO Platform is ICONX.